Easter Island: Garlands of freshly woven flowers welcome us to Rapa Nui, the tiny Chilean island, 4000 kilometres from the mainland, that remains steadfastly Polynesia. We are in perhaps the most remote inhabited island in the world – our nearest neighbours are on Pitcairn Island more than 2000 km away. The tiny island only appeared relatively recently (750,000 yrs ago) by the eruption of three volcanoes that rose from the seabed and fused to create a triangular shaped landmass of less than 25km at its longest point. The first people to reach the island sailed here from Polynesia some 1200 years ago on double-hulled canoes, bringing chickens, some vegetables and a wealth of culture with them. They set up home on this beautiful island, using the fertile volcanic soils to grow bananas and other crops inside stone enclosures that protected the plants from the winds and effectively retained moisture. They called the island Te pito o te henua (The navel of the world). And they continued their traditional ancestor worshipping practices, developing perhaps the most stunning religious edifices on the planet. The Moais – statues of ancestors carved from stone – are incredible. There is nothing so mesmerising than a human face or form – something that Gormley, for example, continues to exploit well – and these enormous monoliths have an awesome presence. Each is different in size and in facial features. Some look stern, others benign. They have large brows with deep eye-sockets that once contained eyes made from white coral and obsidian (only one remains), broad Polynesian cheeks and noses and thin lips. 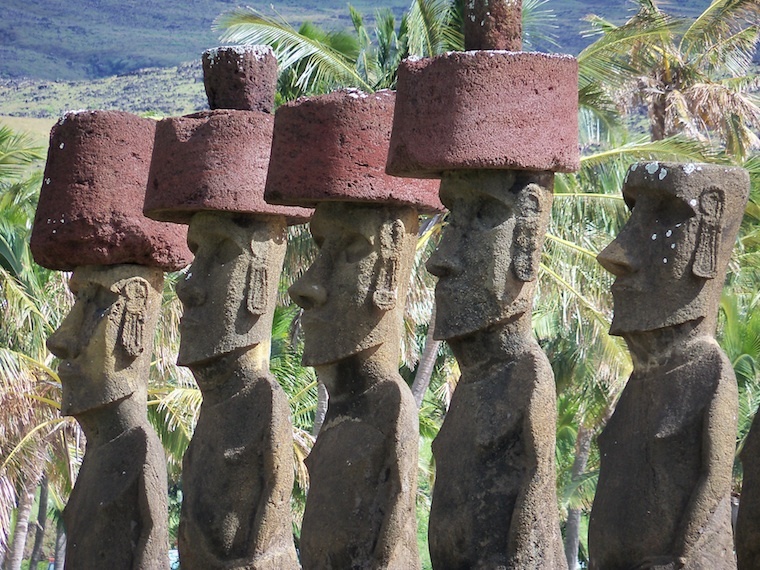 Moai all originally had topknots like these. Some Rapa Nui men still wear their hair in topknots. They stand on sacred stone platforms alone or in rows, overlooking the sites of villages, keeping the inhabitants safe. The islanders grew in number until there were too many to be sustained by the acreage they inhabited. Transportion alone of each new Maoi from the quarry to each village required hundreds of logs. Easter Island is the poster child for a community that over-used its natural resources and suffered the consequences of climate change as a result. Deforestation of the once jungle covered island meant there was no local cloud cover produced from the canopy transpiration, so rainfall reduced and vegetation grew more slowly in a self-perpetuating cycle. This, coupled with soil erosion from deforested areas, led to starvation on the island, severely reducing population levels. 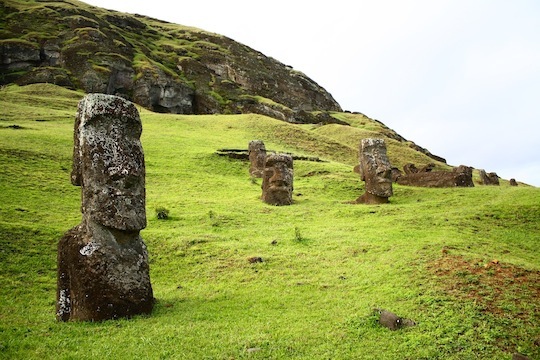 All the Moai were carved at this quarry, and for some reason, many were left here. Perhaps they weren't up to standard, or maybe the people were no longer strong enough to move them. Intertribal wars between various lineages of the Rapa Nui clan broke out with villagers toppling each other’s Moais, killing rivals and eating them. A presumably effective insult in Rapa Nui was “the flesh of your mother sticks between my teeth”. That’s the popular story, anyway. The islanders were more than helped to their fate by Europeans. 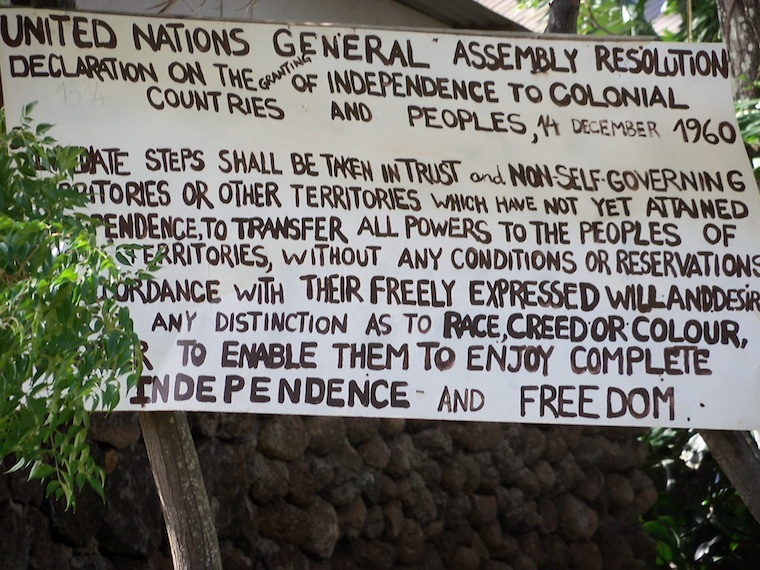 Slave raiders from Peru, for example, took almost all of the men away and many of the women during their visits to the island in the 1960s, including the only people capable of writing the Rapa Nui Rongorongo script, the only example of a Polynesian written language. With no one left who could read or write, the script became instantly and forever indecipherable. To add to the tragedy, when the slave raiders were forced to repatriate people to the island, they did so knowingly including people infected with smallpox, thereby reducing the island’s population to levels where the dead could not be buried. By 1870, 97% of the islands population was dead, leaving just 111 individuals. Most of the Rapa Nui’s culture was lost with its population. Their language remains. A tongue that could be understood easily by one of Captain Cook’s passengers in the 1770s, who came from Bora Bora. And, of course, their wonderful stone men stand testimony to a society that was strong enough to carve, move and install such vast monoliths – the biggest is 21 metres. 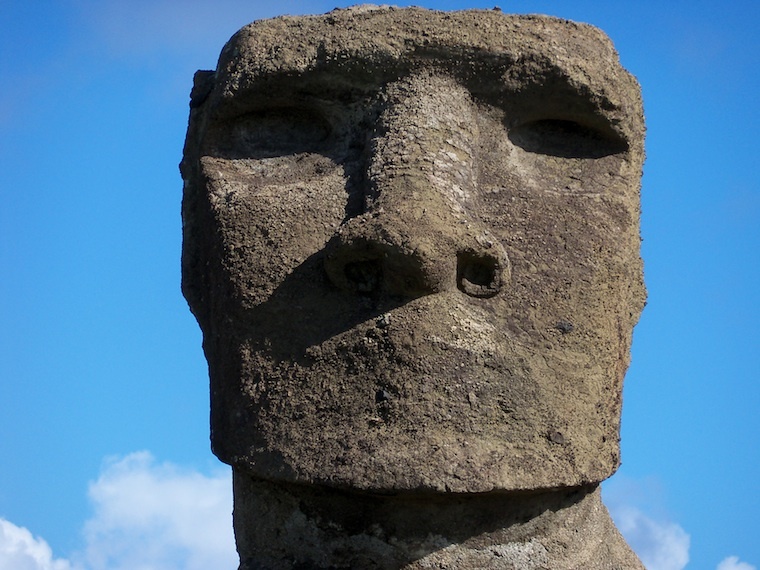 The cult of Moai ancestor worship began to diminish in the 1800s and was replaced by the Birdman cult – something that was also found on Hawaii, so it must have been around for centuries before but kept in the background because of Moai dominance. The Birdman cult was a spring worshiping celebration, involving a competition among the islanders to bring back the first egg of a particular seagull species. Whoever brought back the season’s first egg would be that year’s Birdman. Ceremonial village perched between a volcanic crater lake and the ocean. Used during the Birdman competition in spring. The Rapa Nui people we’ve met and talked to have all been incredibly friendly, welcoming people, most of whom speak some Spanish (more than me, anyway). About half of the population is migrants from Chile, something the indigenous Rapa Nui want to stem – tricky, because the island since 1888 is part of Chile. 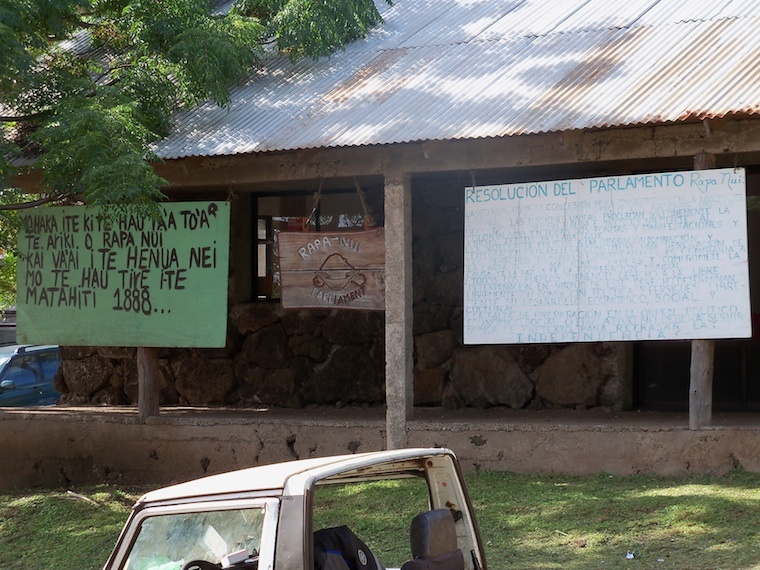 Rapa Nui's 'Parliament' campaigns for independence from Chile. The sign on the left is in the local language. 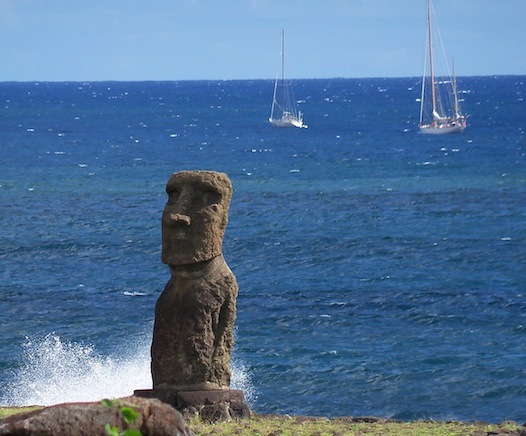 It feels odd, going so quickly from the European Chile to the Polynesian Rapa Nui, with the immediate change in ethnicity: language, facial features, etc. I am used to a more gentle transition. But, actually, the same exists on the mainland, where the starkly Polynesian origins of the Mapuche and southern Amerindians – the first occupiers of the South American continent, 12000 years ago – contrast so obviously with the northern indigenous Chileans of Inca origins, whose ancestors arrived later via an Arctic footbridge. 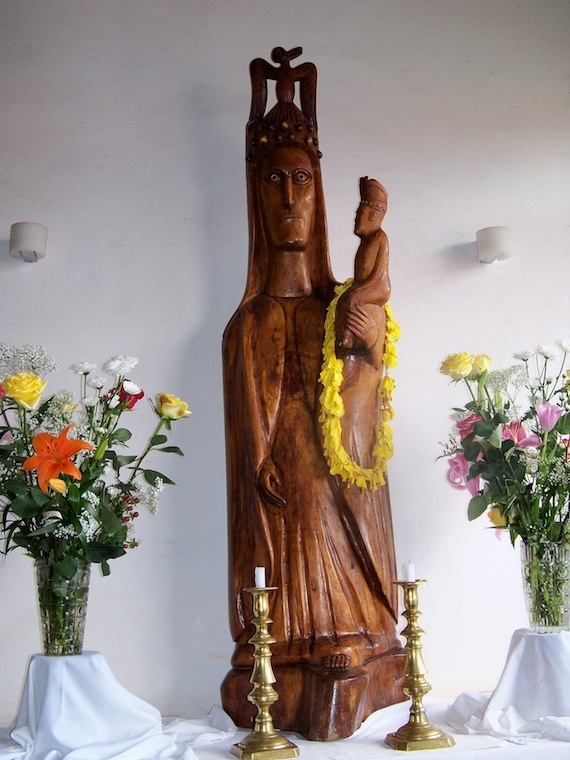 Virgin Mary is shown with the Birdman on her head in Rapa Nui's Catholic church. Right now, in the middle of the Pacific, we are at the most westerly point of South America, the most easterly point of Oceania. And this beautiful triangle of land, with its wild horses, volcanic crater lakes and incredible stone men is disappearing. The plate we are on is moving eastwards and down, subducting under the South American plate. One day, the island will drown beneath the Pacific. 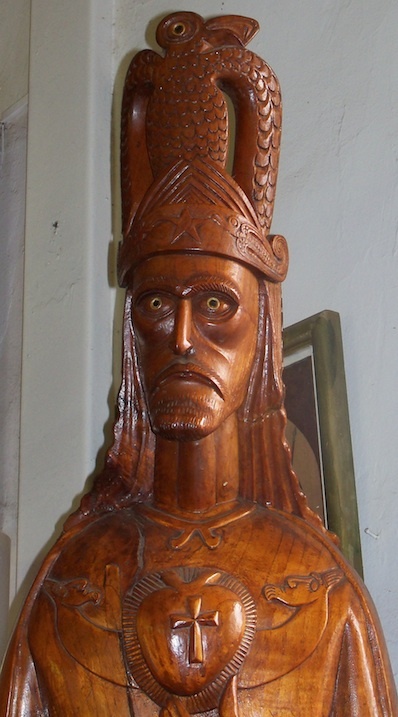 Jesus is shown with the Birdman and Rapa Nui's symbolic canoe carving. The services at the church includehymns in Rapa Nui that have been adapted from traditional songs.